The Stowaway does everything a keyboard tray needs to, does it well, and comes in at a surprisingly low street price. 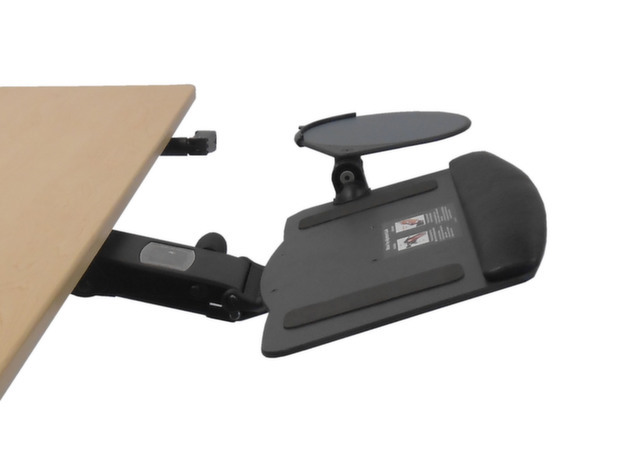 15º of negative tilt is an industry standard for adjustable trays, and while the 5º that the Stowaway adds to that doesn’t sound like much, some users will find the extra tilt essential to finding a comfortable, ergonomic position - especially when using a treadmill desk. A wide range of height adjustment is complemented by removable gel/foam wrist pads (perfect for accommodating ergonomic keyboards). 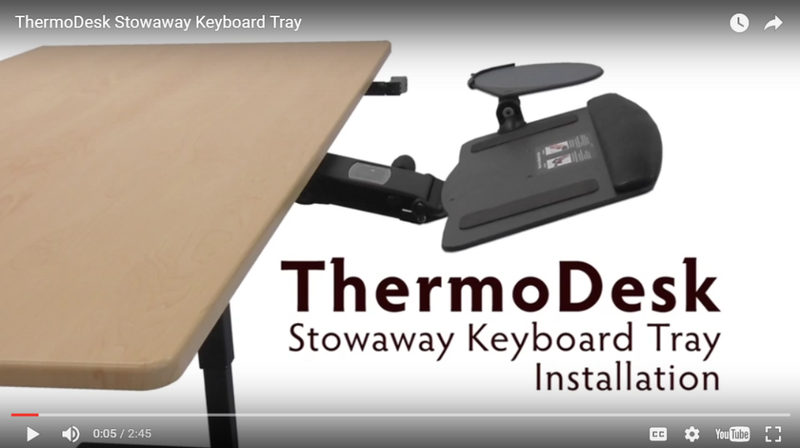 iMovR's innovative, American-made Stowaway adjustable keyboard tray marries functionality with unmatched ease of installation (see video, below). It solves the problem of how to add an ergonomic keyboard tray to a standing desk when there's a crossbar in the way, as there is on 99% of height-adjustable desks. The Stowaway's 21.75” rail is designed to line up with pre-drilled pilot holes on the iMovR Elite, UpTown, Ellure and Upsilon desks, as well as the opposite-side positions on 72" and 83"-wide iMovR Everest and Olympus desks, but can be used with any standing desk - you just have to pre-drill the screw holes yourself using the baseframe as a template, per the video instructions. Like all underdesk keyboard trays, when attached to a two-legged adjustable-height desk there will always be some shake. We always recommend the option of using one of the iMovR Omega desks with their built-in SteadyType keyboard trays if you're planning to add an underdesk treadmill to your workstation. 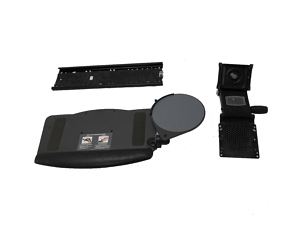 iMovR asked us for our recommendation for an OEM keyboard tray – we had an easy answer. ISE’s Leader 5 has long been our favorite adjustable tray, and we’re glad to see it return with better documentation in the Stowaway. iMovR went the extra mile with this one, as all iMovR desks come with pre-drilled holes to expedite Stowaway installation. iMovR’s Stowaway keyboard tray passes both requirements with flying colors. While the industry standard for negative tilt is 15º, the Stowaway goes the extra mile (well, 5º) and can be adjusted to negative 20º of tilt. This seemingly minor fix can do wonders for your wrists, as a few extra degrees allow a typist to keep his or her hands in a comfortable, neutral position. The Stowaway also shines in terms of vertical height adjustment. Most similar products bring around 6” of height adjustment – iMovR’s closest competitor quality-wise, Humanscale, manufactures an arm with 7” of adjustment. The Stowaway is capable of 8.8” inches of vertical adjustment, the best we’ve seen from a standard keyboard tray arm. With such a sweeping range of adjustment the Stowaway can actually reach above the desk surface. For very tall individuals whose adjustable height desks just don’t reach high enough for ergonomic comfort this added height can be a real blessing. The Stowaway’s lever-locking system is easy to use and holds fast in any position. Lifting the front of the board allows a user to vertically adjust the tray arm, while lowering it locks the Stowaway firmly in place. 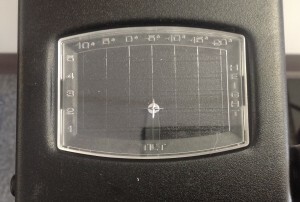 A handy knob controls negative tilt (the Stowaway can also adjust to 10 degrees of positive inclination, a good option for users who prefer to work in a reclined position). All of these adjustments are tracked by a small grid on the front of the of the tray arm. We love this feature – yes, partly because it looks cool (it was instantly dubbed the “battleship board”), but also because it makes tracking and remembering your favorite positions much, much easier. Most adjustable keyboards trays come in one of two shapes. “Big board” options are exactly what they sound like, and are designed to accommodate keyboard and mouse side by side. The other option – and the one we prefer – comes with a smaller keyboard platform and an attached mouse tray. The second design carries a few advantages. 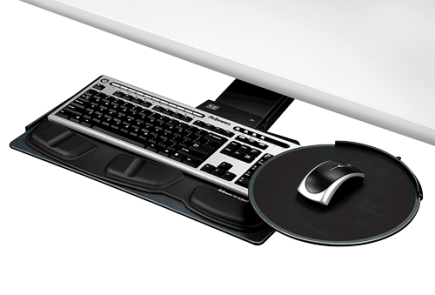 The mouse platform can swivel around from any position on the left or right edges of the keyboard tray, allowing you to bring your mouse closer to your body (eliminating reach is ergonomically beneficial). What’s more, the platform also has a couple of inches of independent height adjustment, and independent tilt adjustment – both of which are really handy features, as the best location for your keyboard isn’t necessarily the best for your mouse. Those of you with Microsoft Natural ergonomic keyboards, or similar products, also have the option of removing the leather-like foam-filled palm rest, and using your board’s built in rests instead. iMovR built their tops with the Stowaway in mind, and we would be remiss if we didn’t talk about the predrilled holes for keyboard tray installation that come standard with any ThermoDesk top. These pilot holes made placing and installing the tray enormously easier and faster. All trays we’ve seen before had to be carefully positioned and installed – a process we all quickly learned to dislike here at the office. No one really likes guddling about with templates, drill bits, and tape measures – something that iMovR mercifully took to heart. Pilot holes cut installation time in half, by making it a simple matter of lining up the rail and screwing it in. The 21.75″ rail of the Stowaway is meant to be installed horizontally along the leading edge of the desk, either flush against the edge (for greater height adjustment), or recessed a couple of inches (to allow a user to stay close to their desk). Horizontal placement helps ensure that a user can find an ergonomic position to work from, and removes some of the stress of getting the rail perfectly placed during installation. While this decision doesn’t allow “roll-away” storage – i.e. sliding the tray under the desk – Stowaway trays can still be tucked away when not in use. A swiveling mechanism makes it possible to swing the arm under the desk, completely hiding it and preventing any bumps from passing coworkers. The Stowaway comes with a solid, solid warranty. Doesn’t get much better than “lifetime”.